The Mystere IV was used by three countries; France, Israel, and India. India was the largest export user of the aircraft. India procured 104 of aircraft in 1957 and it was used extensively in the Indo-Pakistani War of 1965. On 16 Sept 65 a Mystere IVA shot down a Pakistani L-19. On 7 September 1965 an Indian Mystere shot down a Pakistani Lockheed F-104 Starfighter in a raid over Sargoda. The Mystere pilot Devayya was later awarded the Maha Vir Chakra posthumously 23 years after the battle. During the campaign Mystère IVs also destroyed Pakistani aircraft on the ground including four F-86F, three F-104 and 2 Lockheed C-130 Hercules transports. 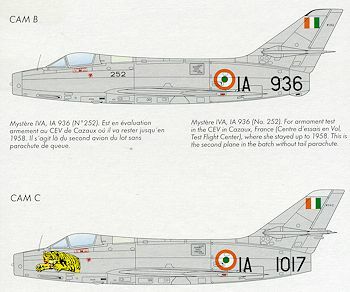 The phasing out of the aircraft as a fighter started soon after the 1965 Indo-Pakistani War; though it saw further action as a ground attack aircraft in the Indo-Pakistani War of 1971. 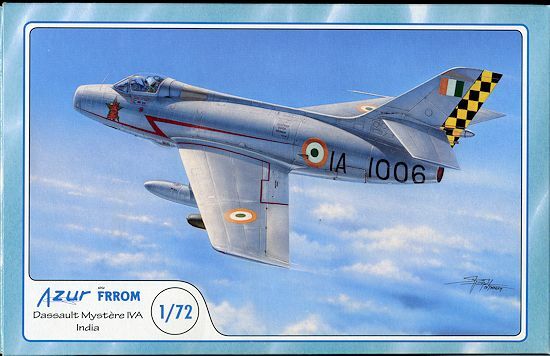 It was completely phased out of the Indian Air Force by 1973. 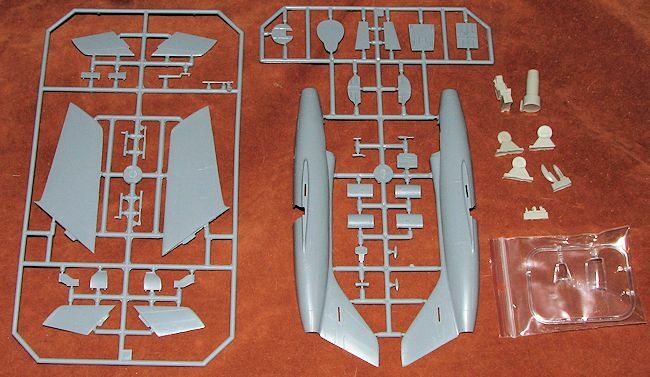 One of the MPM/Special Hobby/Azur family of kits, this is one of three different and I would suspect nearly identical boxings of the Mystere IVa that have recently been released. This one concentrates on the Indian aircraft with the others leaning towards the French and Israeli aircraft. As such, I would expect there to be little that is different aside from decals. As this is a multi-media kit, there is a small etched fret and a small bag of resin bits. The plastic itself is very nicely detailed and has a sort of rough feel to it, like fine sandpaper. This is not unusual for short run kits and does not detract from the building or painting of the model. 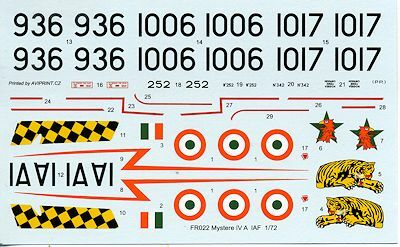 There are a few parts not used in this kit, the main ones being a separate set of horizontal stabs without elevators, used on those aircraft with a 'flying tail'. The Indian version uses the ones with the elevators. The basic kit is relatively simple as these kits go. The cockpit is built up of a floor, side walls and fore and aft bulkheads. Much of the interior is where one uses some of the resin (the bang seat) and a goodly amount of the photo etch (instrument panel, harness, rudder pedals, control knobs). The rest of the photo etch is used for oleo scissors and a radio mast. Regarding the rest of the resin parts, they are used for the exhaust, wheels, and for a couple of bits on the rear. Specifically a tail bumper that is only used for one option and the braking parachute housing used on the other two. A gun sight and a few other small bits complete the resin. The clear pieces are well done and consist of a landing light as well as a separate windscreen and canopy. The canopy is shown as being built closed as there is no mechanism included in the kit. I found it interesting that there are intake ducts that are included in the kit to be capped by the splitter. Of course, doing this way really limits where you can put nose weight as, though not shown, I am pretty sure this one will need some. The nose gear well is incorporated with the cockpit assembly while the center part of the main well is built up of four sections and installed prior to closing the fuselage halves. The wings are a single piece on each side. Gear is well detailed with center doors shown closed as the y should be. Markings are for three planes. One is the box art plane with 8 Squadron in 1965. T he second is the one retained in France for weapons trials so has no unique markings. This plane has no braking chute housing and has the tail bumper. The third has a large tiger's head and was assigned to 1 Squadron in 1965. This unit took part in the 1965 war and was the first Mystere IV unit to attack a PAF airfield. All planes are unpainted metal. The decals are very well printed and are probably quite thin. Those seeking aftermarket will find some, but they are few and far between. Instructions are well done with the usual Gunze paint references. It is a delight to see this important French jet done properly in 1/72. 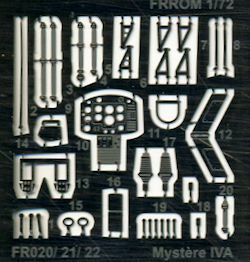 Before this there was only the rather basic Matchbox kit to serve the injected plastic crowd while in 1/48, there was the rather more difficult to build F.M. kit, which your editor managed to cobble together. Any collection of French planes should have this one added to it. Thanks to West Coast Hobbys for the preview kit. Get yours at the link.